The county seat of Macon County, Franklin NC is a small town located one hour from Asheville NC and only 2 hours from Atlanta GA. According to Wikipedia, It is also known locally as the "Gem Capital of the World." The Cherokee Indians were the first people to inhabit Franklin NC and the remains of Nikwasi Mound are still visible downtown. Today, tourism is a large part of Franklin's economy and the summer brings numerous visitors due to a temperate climate. In the 2010 census, Franklin NC was home to just over 3.800 people. Currently, Franklin is experiencing is growing at a rate that is 12% over the national average. This is due, in part, to an increase in the retirement population, which makes up 23.5% of Franklin's residency. In addition, the cost of living index in Franklin NC is 86.7, which is less than the U.S. average. According to Trulia.com, Franklin NC reportedly had a median sales price of $125,000 from August 2012 through October 2012. This is an increase of $8,000 from the same period last year. Other statistics reveal an average listing price of $197,880 and an average of $139 per square foot. With 64 home sales from August through October, Franklin NC has seen an increase of 54%. John Becker "Bald Head" is a Real Estate servant/broker in Franklin, North Carolina.The Franklin NC market is primarily made up of "second homes" but not limited to that exclusively. 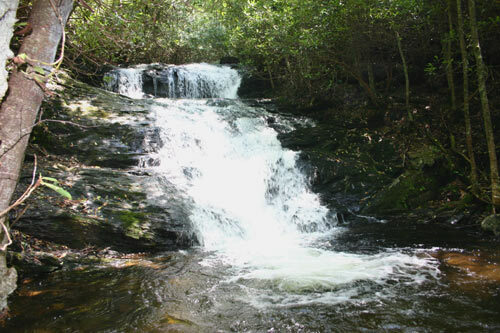 Located in the beautiful Smokey Mountains of Western NC, Franklin is a desirable place not only for many of today's retirees, but for anyone who wants to live in a friendly, quiescent and visibly therapeutic environment. A resident of Franklin NC, since 1993, John is uniquely qualified to help Buyer's & Sellers of real estate in the Franklin area. As an Accredited Buyer's Representative (ABR), Seller's Representative Specialist (SRS), and Short Sales and Foreclosure Resource (SFR), Mr. Becker is well trained to assist you in these highly specialized fields of real estate representation. John Becker / Bald Head one of Franklin's leading Realtors, is the Broker/Owner at BALD HEAD REALTY located at 33 Pine Lane in Franklin, NC. As a former associate Broker at Exit Realty, John has been the lead listing and selling agent each year since beginning his real estate career there in 2006. In the challenging year of 2009, Mr. Becker was amongst the "Top 10 Exit Realtors" in all of North Carolina. And is now ranked #1 in North Carolina from January 1st through December 30th of 2011 for the most transaction sides "closed". John, was recently voted "Realtor of the Year" for 2010 by his peers and colleagues in the Franklin Board of Realtors!